Besides our core use cases of XVA-Analytics, Compression and Trade Repository Reporting, which are all focussed on substantially improving collateral services in derivative deals using blockchain technology, we are also offering a service to anyone who is dealing with cryptocurrencies at large scale. The application is called CCP FOR CRYPTOS and is a side-result of our own business activity which we have decided to offer to the wider market. Imagine you are doing an ICO – your investors will want transparency and insight into the rate at which they would get paid back if for whatever reason you do not manage to launch your business. As cryptocurrency exchange rates can show some significant variation over time you will need to keep them in the loop about current „payback rates“ depending on the variation of crypto market price over the last couple of days. These so-called „haircuts“ need to be communicated to all crypto-investors on a regular basis. Example: If someone invests 1 Bitcoin today you would pay her back 1 Bitcoin in the unlikely case of a liquidation using the value of the Bitcoin (as determined via the BTC haircut) on the day of liquidation. Precisely speaking: if Bitcoin value has gone up by 20% the investor will benefit from this development regardless of having the Bitcoin „parked“ with you or not. Following a successful ICO you will want to spend the money on building your business. Let’s assume this includes cost such as hiring developers and sales people. As these costs will need to be covered in FIAT currencies (e.g. Euro) you will need to exchange the cryptocurrencies you collect from your investors into FIAT. These exchange exercises will need to be phased over time to happen when you need them and will need to be hedged to make sure that your funding does not suffer from eventual dips in crypto value. To enable these and other necessary operations and the complex calculations required for them we have adopted a mechanism called CCP (Central Counterparty Clearing) that is an established process in the world of derivative trading. Our CEO and CRO Thomas Schwiertz is a renowned expert in this area, having contributed to the CCP framework used by EUREX. You can find an expert description of CCP for Cryptos below in case you want to deep dive into this topic. We are happy to offer our expertise in this area to anyone who is doing an ICO or dealing with cryptos at large scale in general. 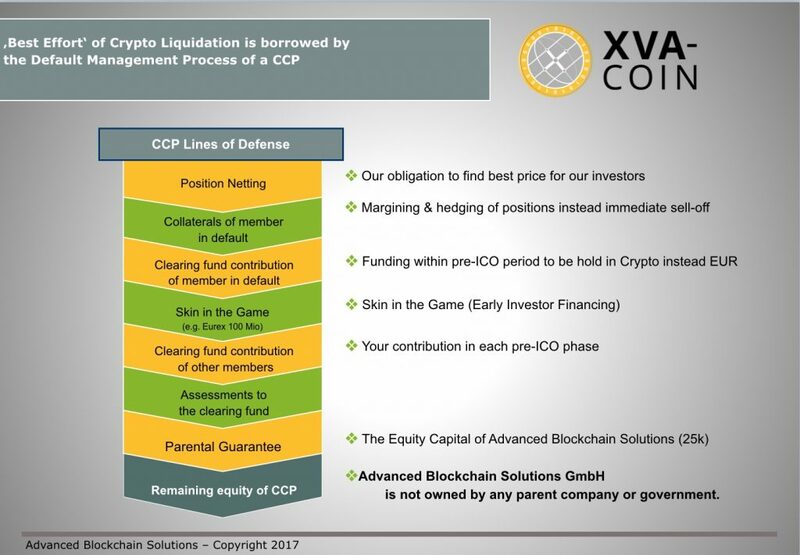 Besides our core usecases on the XVA-Blockchain, CCP for Cryptos as a general service offering based on our industry expertise is an additional revenue driver for Advanced Blockchain Solutions. CCP (central counterparty clearing) is a service designed to reduce the default risk of a party or business entity involved in a derivative deal. The CCP manages the counterparty’s credit risk. An example would be a derivative deal where both parties contribute into a clearing fund (based on their respective default risk as determined in XVA Analytics). The clearing house contributes along with them to form the clearing fund which is used as an “insurance” against default risks of each market partner. The clearing house’s contribution to the clearing fund is often referred to as “skin in the game”. Within the CCP there are several so-called “lines of defense” that describe measures taken to protect all involved parties with regards to their financial involvement. And what is a CCP for Cryptos? In the case of our CCP for Cryptos we have borrowed the best practice of crypto liquidation from the Default Management Process of a “normal” CCP. You can download a deep-dive into CCP for Cryptos methodology here. As described in the intro, we are planning to offer our expertise on this topic as a paid service to anyone dealing with large amounts of cryptocurrencies as a add-on service offered by Advanced Blockchain Solutions. The crypto currency business turns gradually into a de-centralized cleared segment. The impact of regulation and the increasing cost of capital, combined with the drive for operational efficiency, supports clearing. Advanced Blockchain Solutions’ distributed ledger is a natural foundation for CCP. The blockchain as source of trust between the involved counterparties combined with smart contracts that allow for an incorruptible execution of pre-defined contractual terms offers an ideal infrastructure for clearing of crypto derivatives. Using the same trustworthy technique that enables crypto currencies at all for clearing of such contracts is just a natural consequence. Advanced Blockchain Solutions has embraced change and innovation to make the Crypto CCP a fundamental part of its day-to-day business. The development and implementation of a de-centrally cleared solution is part of our strategy to incorporate new and innovative offerings that assist members to increase capital efficiencies by maintaining and supporting the bilateral, relationship driven characteristics of the market. Advanced Blockchain Solutions strives to be one of the leading central counterparts for crypto derivatives based on blockchain technology globally – ensuring the safety and integrity of markets while providing innovation in risk management, clearing technology and client asset protection. Advanced Blockchain Solutions will provide fully-automated, straight-through post-trade services for derivatives, and funding & clearing, as well as industry-leading risk management solutions. XVA-Blockchain - building trust in capital markets.